Spring has definitely sprung here and on the Penny Black blog; there are two weeks of spring inspired projects to enjoy if you pop over there. The tulips are up in my garden but not blooming yet, so here are a few in bloom. After deciding to leave the tulips as outlines I wanted to add something a little fancier to my card so I embossed the whole card front in clear embossing powder using the Penny Black Damask Pattern background stamp. I was quite happy with the subtle result, it really looks like…well, linen damask! The close up below gives you an idea. 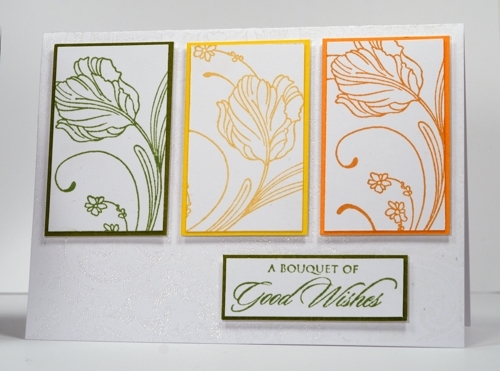 For the tulip card I used Delicate Florals, Gratitude and Damask Pattern. The inks are memento and the cardstock Penny Black Mix and Match papers Summer Sun, Fall Festival & Fern Green. Great colours and I love that you moved the flower slightly in each panel! I love both these cards. I’m a flower person, and tulips are my absolute favorites. Adding the subtle embossed damask is such a lovely touch. 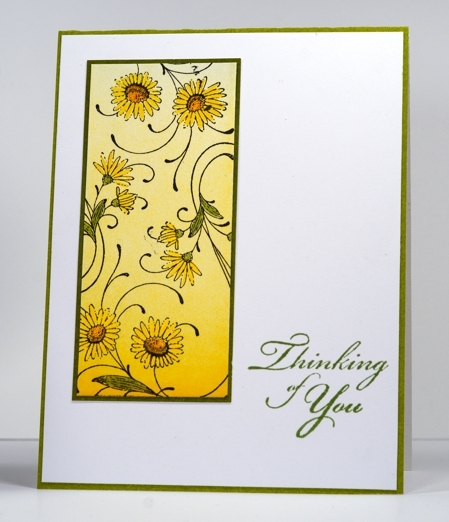 The daisies in your second card are beautiful, and you did a fantastic job coloring them. I’ve never bought Penny Black, but I clicked on every stamp set you used, and I just have to have a couple of them! The flower sets are gorgeous, and that sentiment set is really great. Lovely cards, Heather! These tulips are beautiful in bloom, like mine in my garden (it’s less cold here). I love your idea for your background, it’s wonderful. Your brayered background with daisies is stunning. Yellow on yellow and it’s looks so good. To make the daisies white, you could have coloured them with bleach after your stamping and brayering was done. Don’t know if you are familiar with the technique. Anyway these cards look stunning and I love them both. Very new to your site but became addicted quickly. You are very talented but the deceptive simplicity of your work makes others feel they can HAVE A GO! Thank you for that encouragement. Penny Black stamps are lovely. Live in UK and find it hard to access the entire range. Beautiful spring colors Heather! The Damask Pattern is a gorgeous background. Stunning yellow transitional panel art. 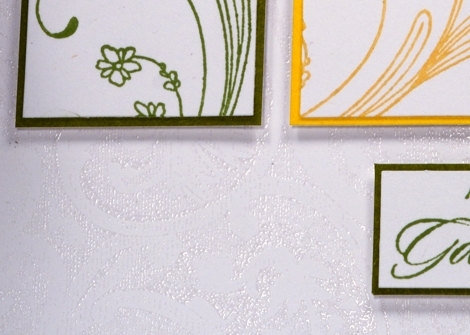 The clear embossed base on the first card is fabulous, as is the way you used the tulip stamp at different angles. The colouring over the brayered panel works perfectly on the second one. Both are terrific! Both of these cards are lovely but my favourite is the top one. I love these panel layouts where the contents vary slightly and I love the colours you’ve chosen.